The complete series consists of seven large geometry templates made out of durable plastic. Each of these templates is sized to fit over a regular (8.5” x 11”) sheet of paper. For the Preschool children, the templates can be used to reproduce all the basic shapes of the Geometric Cabinet and they are invaluable for providing effective coordination exercises, drawing, and naming geometric shapes. 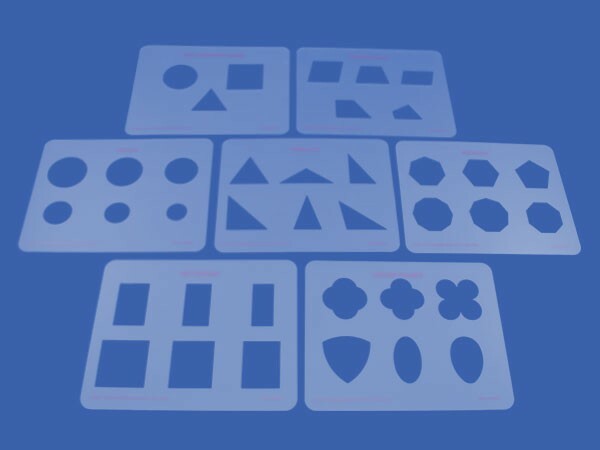 At the Elementary level, the templates are ideal for solving problems with angles, perimeters, and areas.